Unfortunately, not many local clubs have websites and fewer still update them with any regularity. For more up-to-date info on what is happening at local watering holes, please visit the SoBNews Blog. For information about and links to some of our favorite island entertainers, visit my South Padre Island muscians page. 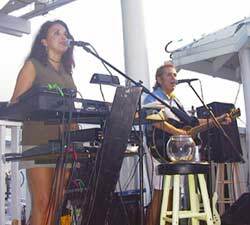 Schlitterbahn's Shrimp Haus introduces live entertainment featuring the music styles of Illusions with Chuck Comeaux and Leslie Blasing. A relaxing hideaway located on South Padre Island, Texas. Full Service Tropical Bar, Restaurant, and Watersports facility. Parrot Head Heaven!! Grab a hammock and join us for fabulous Sunsets over the Laguna Madre Bay. Private parties welcome.